Sometime in 2003, a house in the old part of the pueblo of Cutar was being reformed. The builders knocked through a wall and found a large space in the middle of it, thought to be a sort of larder. Three books, laid with some care in straw were discovered. 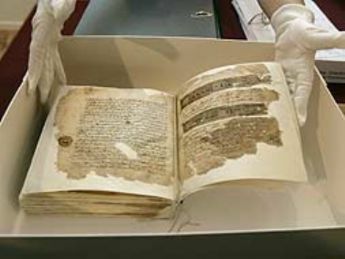 Professor Esther Cruces, who manages the investigation into this evidence and the restoration of the manuscripts thinks that the care with which they were hidden and preserved, suggests premeditation. She dates the concealment at around the date of the Christian reconquest and believes the owner was a Moorish lawyer living in the years 1500-1501, or a Morisco forced out during the general expulsion of Muslims and Jews after the Moorish rebellion in the years 1568-1570. They are thought to have belonged to an Imam from a Mosque, or a lawyer from the pueblo which was much larger then than now. A book of the laws and customs of the pueblo – for example family trees, heredity, matrimonial and trading laws. Consisting of 170 pages each 16 by 20 centimetres. The binding is of parchment. The Islamic Koran: 135 pages without binding, illuminated with inks of diverse colors. An initial inspection reveals that the inks are specific to Andalucia and the writing is in “cúfica andalusí” specific to Andalucia. Some of the characters in the writing are unique in the whole of Spain. Because the last few pages of the book have been lost, the name of the copyist is unknown and the exact date of the document uncertain. The Koran is the most important of the documents. Investigators of the University of Granada consider that this Koran andalusí dates of the XIIIth century. They regard it as one of two most ancient copies that survive in Spain. It seems to have been handed down the generations like a family bible. This accounts for the greater age of this book. Reference: ESPEJO ARIAS, T. y ARIAS TORRES, J.P.: “Estudio descriptivo y caracterización material del Alcorán de Cútar”, en El Corán de Cútar. Edición facsímil y Estudios, Ed. Junta de Andalucía -Consejería de Obras Públicas y Transportes, y Consejería de Cultura- y Fundación Tres Culturas del Mediterráneo, Sevilla, 2009 (en prensa).